Lagavulin Distillers Edition 1996 is another edition of the often celebrated Lagavulin DE line. This one was distilled in 1996 and bottled in 2012 and like the rest of the Lagavulin DE line it was finished in PX barrels to give the bold peat of Lagavulin a wall of sweetness to balance against. Distilled in 96 and bottled in 2012 this is essentially a PX finished Lag 16, but other than pointing out the obvious I have nothing else to add to what we already know. On to the Lagavulin Distillers Edition 1996 review! Peat, caramel, salt, ash, dark sweets, sharp iodine and sherry sweetness. Peat, dark fruits, charcoal, saline, iodine, cocoa and a bit of sherry sweetness. Long drawl of peat, sherry and ash. Ok balance, medium body and a soft simple feel. Lagavulin Distillers Edition 1996 is good. There’s more ash and charcoal in this release than previous years and I’d say it’s sitting in the lower end of the B+ range and not fully nailing the richness of the ’94. I’m getting the sense that these releases are falling prey to the same downfalls as other standards in the whisky world. They’re getting less complex and less interesting as the years go on. I don’t know if it’s because of the stills, the grain, the amount they have to pump out causing less attention to detail, the need for higher volume necessitating poorer quality casks or a dozen other factors. All I know is that at some point this bubble will pop and hopefully a more moderate demand will bring some of the lost quality back to the industry. 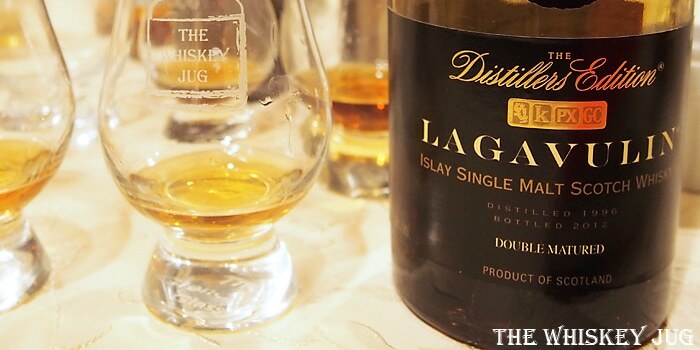 The post Lagavulin Distillers Edition 1996 Review appeared first on The Whiskey Jug.